I must admit to having an (arguably) bad habit; I place my personal photography behind my work photography. That's not a bad thing; the bad thing is how far behind I place my own work. In something that's become almost as much a tradition as a Summer vacation with Alyssa, this is the second time in a row I've taken more than 8 months to edit the photos I shot on Alyssa's trip to DC. This time around I insisted that we take things a little slower than the previous year; doing something every single day for a week in 2015 really wore me out, so 2016 was a more relaxed trip. Plus, that allowed us to catch some of the Rio Olympic Games! We didn't do anything worthy of photos the first two days (it was mostly spent fixing her computer), so this blog starts on Day 3! Alyssa is always jealous of my hiking pictures when she sees them, so we always plan at least one hike when she's here; since I thought Luray Caverns would be something she'd enjoy, I planned our entire day in the Shenandoah Valley, starting with Luray Caverns. It'd been a few years since I'd been to Luray Caverns, but of course Alyssa had never been. Things have clearly changed since the last time I'd visited; of all the times I've visited, I've never actually been given a tour before. Actually, I've never even had to stand in line to get in. Every time I've been you've just paid for entry and you're given free reign to walk around the cavern at your own pace. Not this time though; we actually had to wait in line, and once inside we were part of a guided tour with around 30 people. A very different experience than my previous visits, but still enjoyable. I've previously taken the audio tour, but I found the guided tour more educational and much more enjoyable. The only reason I can guess for getting a guided tour this time and not my other visits is this is the only time I've been to Luray Caverns during Summer, which is of course peak tourism season, plus all those students are out of school and available to intern at the Caverns. Something that really, REALLY bothered me was that the intern bringing up the caboose of the group had a serious disrespect for the nature and longevity of Luray's formations. On several occasions I spotted him touching the stalagmites and stalactites with his bare hands. He clearly knew he wasn't supposed to be doing it because he stopped when he noticed me watching him and our eyes met. Incredibly disrespectful to the 64 acre underground natural phenomenon. Just touching the mineral deposits that compose the stalagmites and stalactites leaves skin oil and other contaminants that halts their growth. Currently most of the formations in Luray Caverns grow at a rate of 1" every 120 years, but that permanently stops when contaminants destroy the fragile conditions required for the formations to grow. It has been argued that it's bad that (a small) part of the caverns has been opened to the public - I mostly disagree with this because I think more-or-less sacrificing only a small portion of the cavern is the best way to display and educate the public about the natural phenomonon. That being said, it makes me angry that Luray Caverns staff themselves can be found palming the formations and at one point even dragging his palm against the wall while walking. But let's get back to some positive. Luray Caverns is home to The Great Stalagpipe Organ. Although it's called an organ, the instrument is actually a lithophone; that is, a percussion instrument using rock to create tones. The "organ" was designed and installed by Leland W. Sprinkle, who found two in-tune formations, and shaved down an additional 35, to create the instrument with 37 notes spread across 3.5 acres, making it the world's largest musical instrument. Each limestone formation is fitted with an electrically actuated rubber mallet and electric pickup (similar to an acoustic-electric guitar pickup), and the tones are amplified through a PA system. Performances of the organ are live, but automated / pre-arranged just like a player piano. The organ keyboard itself is locked-out except for special occasions such as weddings and other events. The Great Stalagpipe Organ can be heard on Pepe Deluxé's album Queen of the Wave played by Paul Malmström. The organ has a playlist of songs it can play at random; here is my video of the organ playing during our visit. If you know the name and composer of the song, please let me know in the comments! Next stop was Stony Man Mountain. You of course have to take Skyline Drive to get there, so I hopped on at the Thorton Gap entrance, and more or less drove South to the trailhead, stopping here and there for the occasional overlook; I've seen pretty much all of them, but Alyssa of course hasn't seen any. Years ago I hiked Little Stony Man, so when we went up Stony Man I was very surprised how much shorter and easier the trail was to get to the summit. Stony Man's summit trail is pretty much a straight shot up the mountain, taking very little effort or time from the parking lot. The trail is lightyears easier than the Maryland Heights Trail in Harper's Ferry I took Alyssa to in 2015 - that one's difficulty, despite my warning her, really caught her off-guard. This one was much easier than I'd planned on. Beautiful overlook at the top, and by chance we found some cool rocks on the edge of the trail that made for some awesome outdoorsy portraits as the fog began to roll into the valley below us. We still had a few hours of daylight left, and before continuing South on Skyline drive, we dropped in on the nearby Skyland Lodge to check out the gift shop if anything caught Alyssa's eye - I eyeballed a marbled coffee mug that I ended up getting a few months later during my annual Fall trip along Skyline Drive. We went for a leisurely drive as the fog got thicker, running through the gears with the windows down in the beautiful, and surprisingly dry, weather that day. I've never seen fog on Skyline Drive before (maybe because I've only visited in Fall before this? ), and between that, the thick tree cover, and golden setting sun, it was a very surreal drive back by time we decided to turn around and head back. I insisted on stopping at one overlook just after sunset to catch a cool toned photo of my car - it's much easier to do this sort of thing in the Summer when there are practically no other people and cars to contend with. Oh, the International Spy Museum. A museum I've walked past more times than I can count, yet had never visited. I'd even been to the now-closed-for-relocation Crime & Punishment museum, which, by the way, I can't recommend enough. Day 4 was the longest day of our adventures because we squeezed the most in, beginning with a reservation to Operation Spy at the International Spy Museum... unfortunately we arrived 2 minutes late, and they wouldn't let us into that or rebook us to a later time even being 2 minutes late! With a little, um, prompting... they at least refunded us. The day didn't start off very well, but that was the only hiccup for the rest of the day. We did get into the rest of the museum, and frankly I'd like to go back, because even after spending hours exploring, I'm pretty sure I still didn't see everything or get to read and learn as much as I'd like since it was packed with Summer tourism. The second half of the museum is whatever rotating exhibit they have visiting; it was the spy tech from the James Bond universe. Really cool stuff, being a Bond fan as most people are. The only suggestion I'd make is better separation between fact and fiction; all of the "artifacts" are fictional, and I'd have enjoyed seeing more explanation of how the fictional items tie into factual technologies; there was a little bit of that, but I was still left with a little unease knowing that a lot of the people visiting probably thought some of the movie props were real-world artifacts. Awesome Bond collection exhibit nonetheless. Next we went a few blocks over to what has always been my favorite museum in DC; the National Portrait Gallery. I unfortunately missed the portrait of Colbert over the water fountain a few years back, but one of my couples was fortunate enough to see it; that's actually where James popped Danielle the question! We spent a good portion of time in the National Portrait Gallery, but we didn't dilly dally too much since I was making sure we had enough time to make it to the National Postal Museum. Visiting here was a complete surprise for Alyssa, because I'd eagerly been awaiting the exhibit's opening, and I had purposely never mentioned it, waiting for Alyssa to get into town before seeing it. I've followed PostSecret since Frank Warren began the project from his Germantown home in 2005. I don't look up the newest secrets every Sunday they are posted, but I do read them once or twice a month; Feedly catches everything for me to read later on. 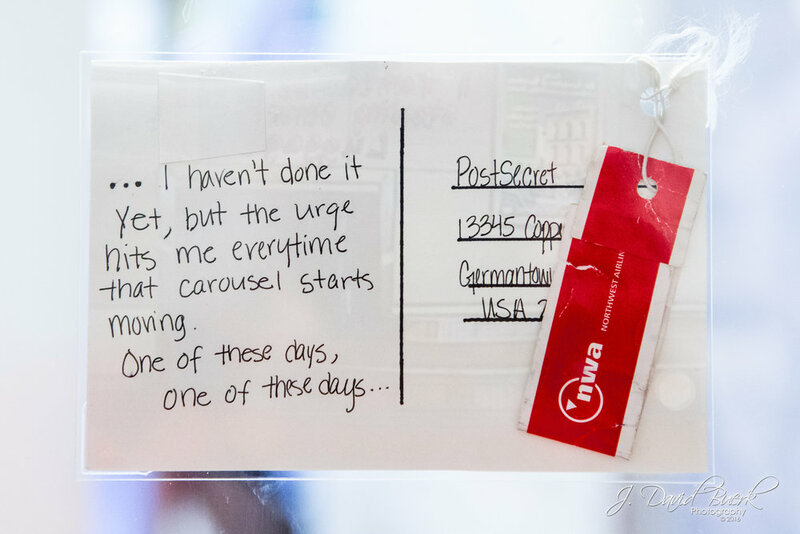 For the uninitiated, PostSecret doesn't need much more introduction than this: people across the World anonymously send in handmade postcards bearing their secrets and their souls. Usually the cards have original artwork or photographs, other times they're relevant imagery that highlights location or timing. And on some occasions, entire items are mailed, such as wedding rings, dolls, and other mementos leftover from past relationships and events. (Full Disclosure: The Museum of Broken Relationships in LA is in my top five of locations I want to visit on the West Coast.) Mailing a secret is an outlet to creatively share your secret when you may not have the strength or ability to share it with anyone else. 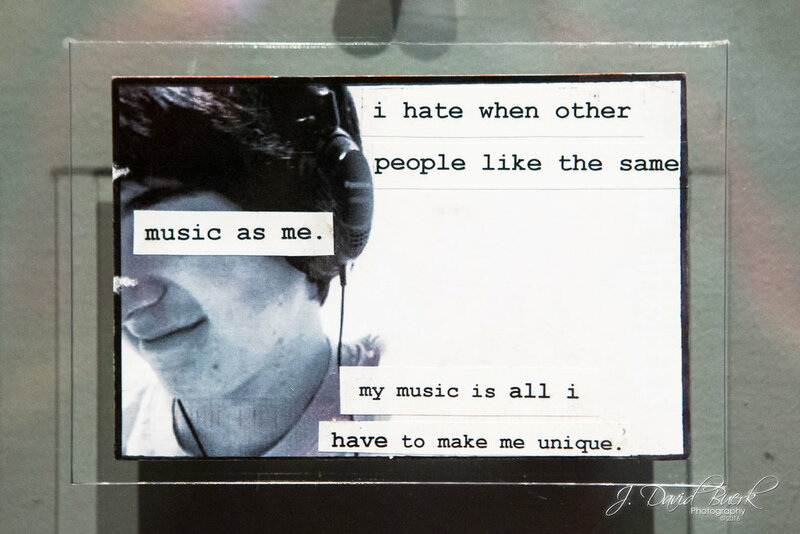 PostSecret quickly amassed a worldwide following and subsequent support community, as it unites everyone with their own personal struggles through shared humanity. I captured most of the secrets on display, and I've included a small gallery of some select secrets you can scroll through and read below. After a long day of museum hopping, it was time to sit back and relax with some half-smokes and "doughboys" at Nats Park. I neglected to tell Alyssa that I'd gotten us seats in the N-A-T-S-NATS-NATS-NATS-WOO! section. The Nats beat the Giants 5-1, so section 313's reaction caught her off guard the first run or two. Those were pretty great seats, right on the rail. That said, the only seats I've had at Nats park I didn't like were in the outfield; Nats Park provides a great view of the game pretty much anywhere you sit, regardless of level. After the game we went over to check out who was playing at The Bullpen on Half Street. People were playing soccer, inspired by the Rio Olympics, in front of Jeff from Accounting performing. The next morning was Imran and Hina's wedding in Virginia; the weekend before I'd been in Houston for their wedding based there. The wedding here was much smaller as usual. I just relaxed and enjoyed with Jake and Alyssa; I'd referred Imran to Eddie early that year to shoot his wedding. After the wedding, Jake, Alyssa, Eddie, and I head over to Brine in Mosaic District and met up with Loreal for our own little wedding after-party. I ended up trying raw oysters for the first time, and found that I love them. I'd had steamed oysters plenty of times, but never found a raw bar I trusted and been in the mood to try it at the same time until then. I'm looking forward to next time I get them; maybe the next time Natalie is in town we'll have to go back to the oyster bar in National Harbor since that's the place we first met each other. Some fun backstory here is that at this point Eddie had been brainstorming his proposal to Loreal with me. He pretty much had it planned out at this point, and just an hour earlier while shooting the wedding, he pulled me aside to show me a picture of the ring he had for her. He popped the question a few weeks later on a trip to Hawaii, and the rest is history! Now I’m hearing all the wedding planning brainstorming lol. For Alyssa's last day, I *had* to take her to a winery. She'd been begging me the entire trip, and we kept putting it off and putting it off. So with just a few hours before her flight, we made it happen; I took her to my favorite winery around here, which also happens to be probably the classiest and closest to a Napa vineyard in the Northern Virginia Region (Potomac Point Winery is a very, very close second in my book, if you're curious). Alyssa's the biggest lightweight I've ever met, so after just a tasting she's tipsy in all these pictures. I did a stupid on the way to the airport. Alyssa had gotten a wine glass from Stone Tower to take home with her; it was wrapped up, placed "safely" on the back floorboard where nothing could get to it. Well, after Alyssa was done scrolling through the pictures on my camera, I reached back and dropped my camera onto the back floorboard... where "nothing can get to it!" *CLINK! * Well at least it sounded pretty when I shattered it! Stone Tower's wineglasses are oversized, laser cut and engraved, and most importantly for this story, they're crystal. I don't know of any other vineyard that uses crystal wine glasses. The winery was closed; there was no time to go back even if they were open. I told her to relax; I had one of their glasses at home and I ended up mailing it to her... along with the bag of broken wine glass shards, just to screw with her. The sun set as we arrived to the airport. We got there early enough to get dinner before her flight began boarding - I think I've turned her on to Five Guys - I'm a bad influence I guess. Alyssa has a bit of a granola obsession, which I learned the first time she came (I was finding granola wrappers and crumbs in my car a month after she'd left 2015!) but this year wasn't as bad. I still found granola!... but at least everything I found was unopened, and the crumbs were relegated to the passenger side leg bolster. Improvement! Who knows what our next set of adventures will be, but I'm looking forward to them!